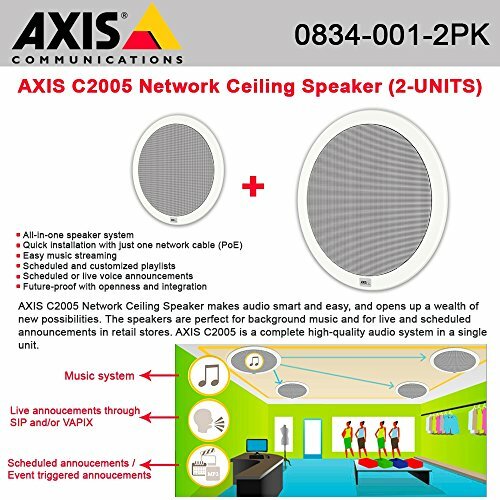 AXIS C2005 is a complete high-quality audio system in a single unit. There's no need for an amplifier, mixer, digital signal processor, streaming functionality, microphone or power supply because they're all built-in. And because it's preconfigured, you don't have to be a sound expert to set it up. AXIS C2005 connects to your existing IP network and it's powered over a single Power over Ethernet cable. Our AXIS Audio Player application is pre-installed on AXIS C2005. It has support for streaming sources and everything you need to schedule playlists with music and announcements. And like all Axis products AXIS C2005 is based on Axis open platforms (VAPIX and AXIS Camera Application Platform, ACAP). If you have any questions about this product by Axis Communications, contact us by completing and submitting the form below. If you are looking for a specif part number, please include it with your message.